After my previous two posts on Positive Impact Scales I was asked how to coach using them. I have seen incredible changes in people and their organizations as they made changes in these four areas: Purpose, Impact, Money, and Ease. Here is my toolkit for increasing Positive Impact. First, let me overview my 4-step process to coach the Positive Impact Scales. I look at Purpose first. If the activity doesn’t fit Purpose, don’t be tempted, just eliminate it. Next I look at Impact. What would produce the most changed behaviors, mindsets, and conditions? Next I look at Ease. How could this activity be simplified or automated so that it could produce that Impact with 100 people or 1000 people with a reasonable amount of Ease? I look at Money last. If Impact and Purpose are high and Ease is high, the Money is usually workable. Money will be a challenge if Ease and Impact are low. 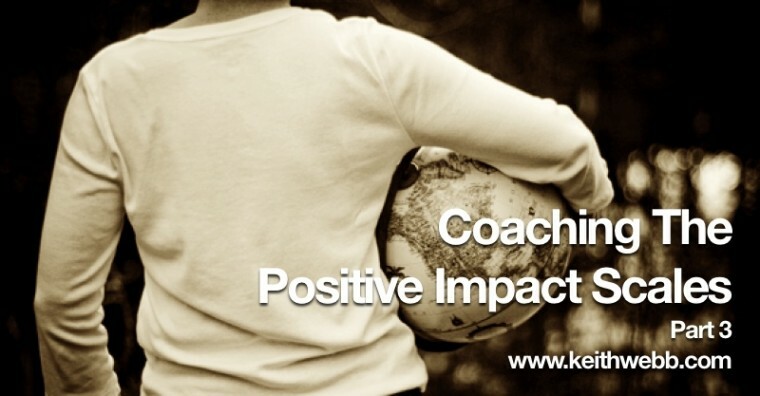 Now, let’s dive into how you can coach on each of the 4 Positive Impact Scales. Purpose answers the question Why? Purpose is the bigger picture you seek to achieve. It is the deeper meaning behind all the activities. For an individual, your purpose will be closely related to your calling and giftedness. For organizations of all sizes, Purpose is your niche, that segment of society you serve with your products and services. If you could do one thing with your life (your organization) what would it be? How are you gifted and wired? What do you want to go BIG on? What problem in the world would you like to solve? Your Purpose is BIG but focused. You will evaluate all activities you want to do through your Purpose. Like this, “I want to hold child raising workshops for parents [activity] in order to create resilient families as communities of love and responsibility [Purpose]. A local church: Reflect Jesus to our community. International Coach Federation: Advance the Art, Science and Practice of Professional Coaching to see humanity flourish. SightLife: To eliminate cornea blindness in the U.S. and around the world. When using the Purpose scale, you measure how much one particular activity relates to and furthers your Purpose. Impact is what happens in the world because of your activities. “Changed lives,” Peter Drucker said, is our goal. We are not seeking just any Impact, but the Impact that relates directly to our Purpose. My friends at SightLife, the world’s leading organization in eliminating cornea blindness around the globe, measure Impact in terms of corneas successful transplanted – sight restored. SightLife does not stray into other noble causes such as literacy, poverty alleviation, clean water, etc. SightLife knows its Purpose and produces greater Impact because all Impact is related to its Purpose. Impact can be measured by the changes in behaviors, mindsets, and conditions of the people you serve and those they touch. What activities would squarely relate to your Purpose? What activities would would produce the most Impact – changed behaviors, mindsets, and conditions? What Impact do you expect to see from this activity? How directly does this Impact relate to your Purpose? What could be changed to produce greater Impact from this activity? The Money scale shows how much money can be generated (earned or raised) from an activity, minus how much it costs to produce and run it. Money is the financial net gain from an activity. Many social entrepreneurs, ministry folks, and non-profit leaders do not like to think about Money. “Money is a necessary evil,” is the sentiment of many. They see making money and life change as incompatible. Either you earn money, or you change lives. I disagree. Money is a tool. It’s a resource like your time and talent, like your organization’s personnel and technology. Who would say, “Either we have technology or we change lives, we can’t have both”? The fact is, if you do not have a financial net gain from your activities, you will not be able to do those activities for long. That money can come as earnings from the activity, or from donors who financially support the activity. The good news is, if you plan the Money from the beginning you can form activities in such as way as to be financially sustainable while achieving Impact. What activities would produce the most Impact while also producing financial net gain? What changes to this activity would produce more value in the eyes of customers or donors? How could the costs of this activity (building, packaging, delivery) be greatly reduced? Watch out for activities that produce Money but do not produce Impact around Purpose. I call this Going for Money. Ease is the amount of effort, organization, and staffing required to produce and maintain an activity. It’s admin. It’s also design, product creation, marketing, sales, delivery, I.T. and customer service. Everything you do takes organization. The less effort it takes to produce and run an activity, the greater the Ease scale. A low Ease scale means it takes a lot of organizational effort to do that activity. Ease matters because you have a limited amount of organizational bandwidth, regardless of whether you work alone or for a large organization. When we put effort into Activity A and B, we may not be able to do Activity C. Remember, we are not trying to do everything, but go BIG on a couple things. You must steward Ease as carefully as you steward Money. While leaders usually pay attention to Money and Impact, Ease often gets little attention. Of the four scales, Ease is the trickiest to manage. Organizational effort has a cumulative effect. Systems of activities are created ad-hoc and quickly become complicated. Look at each activity to see how to increase Ease. Also look at the overall system, the collection of activities, to create efficiencies to increase Ease. What activities could you do that would have high Ease, while producing strong Impact? What parts of this activity has the lowest Ease? How could this activity be changed to increase Ease? What parts could be automated rather than manually done with this activity? Which activities in your system have the least Ease? What activities could you replace these with that would produce similar Impact but with much higher Ease? If you were to start over and redesign your system (your series of activities), what would enable you to double Ease? When you are coaching the Positive Impact Scales you will jump around between all four scales. You will focus your conversation on optimizing one scale for a time, then expand to include the other scales. The coaching process is dynamic, because the scales are often trade-offs between the other scales – we trade Money for Ease or Ease for Impact, for example. The changes and tradeoffs needed to increase Positive Impact will often be painful and frustrating for the coachee. Bring your empathy as well as your strength to the coaching conversation. What If You Could Multiply Your Ministry Impact?